Please enter an amount that you would like to donate to our site for your e-Books. We understand that some of you can't afford to pay anything. If that is the case, just click on the download button. Whatever you can afford is fine with us and is greatly appreciated. A portion of your donation will go to Childhelp®, a non-profit organization that fights child abuse, the rest, to help keep this site up and running. Thank you for your donation. Click on 'Donate' and enter the amount you would like to donate for all five eBooks. This book was first published in 1937 during the Great Depression. It helped extricate many from the bounds of a poor economy and has been ranked as the sixth best-selling paperback business book in Business Week Magazine’s Best-Seller List. At the bidding of multi-millionaire Andrew Carnegie, Hill studied the achievements of a large number of individuals that had accumulated great wealth. This became the basis for his 13 principals for personal achievement enumerated in the book. These principals will show the way to great success to anyone who reads and puts them into practice. 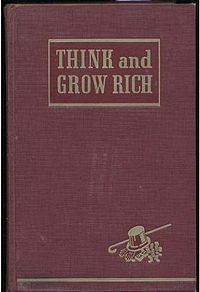 for Think and Grow Rich. · Every action and feeling is preceded by a thought. · A man is literally what he thinks, his character being the complete sum of all his thoughts. · Right thinking begins with the words we say to ourselves. · Circumstance does not make the man, it reveals him to himself. · Cherish your visions. Cherish your ideals. Cherish the music that stirs in your heart, the beauty that forms in your mind, the loveliness that drapes your purest thoughts, for out of them will grow all delightful conditions, all heavenly environment, of these, if you but remain true to them your world will at last be built. for As a Man Thinketh. Wallace D. Wattles' The Science of Getting Rich. This book was published in 1910 and was the major inspiration for Rhonda Byrne’s film and best selling book, The Secret. In 17 easy to understand chapters you will learn how to overcome the mental barriers that are holding you back. You will learn that there is a Science of getting rich, and it is an exact science, like algebra or arithmetic. There are certain laws which govern the process of acquiring riches; once these laws are learned and obeyed by anyone, they will get rich with mathematical certainty. This book will be the roadmap to your success. for The Science of Getting Rich.